Yes. I realize that it’s already the 18th day of the new year and I’m only making my second post. And I’m okay with that. I’ve come to the conclusion that in the past I’ve often fell victim to the urge to post just because I felt like “I had to” and that led to a dearth of posts that were, shall we say, bordering on the unnecessary. So I’m just going to post when I feel as if I really have something I want to share and if that means I only post thrice a month then so be it. Just be glad I finally took down my Christmas decorations. Anyway, the whole purpose of this particular post is that I would like to share with the first cards to enter the hallowed halls of my collection in the year 2013. I guess if you consider my new found resolution to only post when when I have something pertinent to say and combine that with the fact that it’s halfway through January and I’m just now getting to new (to me) cards, it’s safe to say that my collecting has slowed down a bit, but again, I’m okay with that. Much like the way that I started to fall into a vortex of posting just for the sake of posting, I feel as if I was also starting to fall into a pattern of buying cards just because I wanted some new cards and not necessarily because they filled a void in my collection or I really loved them. I say there’s nothing wrong with being a bit more persnickety in my cardboard purchasing habits. So, once again, anyway, the whole purpose of this particular post is that I would like to share with the first cards to enter the hallowed halls of my collection in the year 2013. Shortly after New Year’s Day, I was trolling the eBay in search for a couple of cards that have been eluding me for a while. One of them in particular happens to be a copy of card #514 from the 1964 Topps set. That would be Mr. James Hickman, which also happens to be the last card that I need to complete my 1964 Topps Mets team set. I happen to find a pretty good one that was going off fairly cheap with free shipping and there was only a day or two left on the auction so I placed my bid. Of course, in line with my usual eBay shopping protocol, I looked into the seller’s other auctions to see if they had anything else that I needed or just anything else that was cool. That’s where my first new cards of the new year come in. Although I got outbid at the last second on the Hickman card (curse you, damn snipers), I did end up winning a lot of a certain non-sport set featuring non other than everyone’s favorite caped crusader. They’re from a set of Batman cards that Topps released in 1966. Here’s the back. Apparently, Topps must’ve gotten a really good deal on that orange/pink/gross ink sometime during the mid-60’s because they used it at least their ’64, ’66 and ’69 baseball sets. I’m not sure if there were others, but who cares. No matter how many sets they used it on, it’s still pretty nauseating. 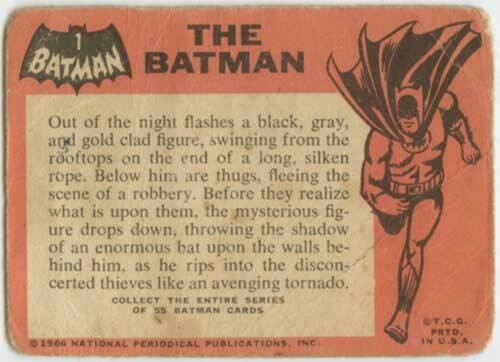 This was actually one of 5 Batman sets that Topps put out in 1966. This one is the first one issued and is commonly referred to as the Black Bat set since the Bat on the front is black. They also released a set that had a red bat on the front, commonly called (surprise) the Red Bat set. This one is also referred to as the A Series because all of the card numbers are proceeded by the letter “a”. The third Batman series featured a blue bat that was called (wait for it) the Blue Bat set. Like the Red Bat/A Series, this one was also named the B Series for the same reasons as the A Series. Neither the Red Bat or Blue Bat sets utilized the same gross orange backs, which has led some to also call the inaugural series the “Orange Back” set. All three of the above sets featured awesome artwork done by none other than Norm Saunders, who was a prolific graphic artist who also worked on other Topps card sets of the era, most notably Wacky Packages and Mars Attacks! The other 2 Batman sets that they put out in 1966 featured color photographs from the old Adam West television show. 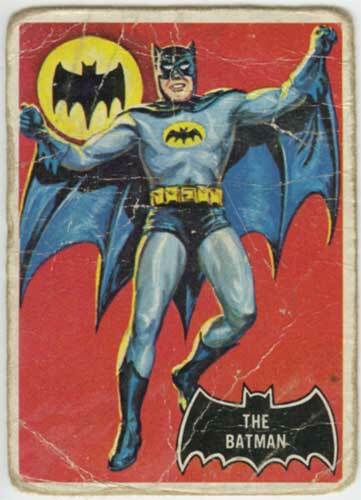 As much as I loved that show as a kid (and still do, occasionally), I’ll take my Batman cards with comic book artwork, thank you very much. 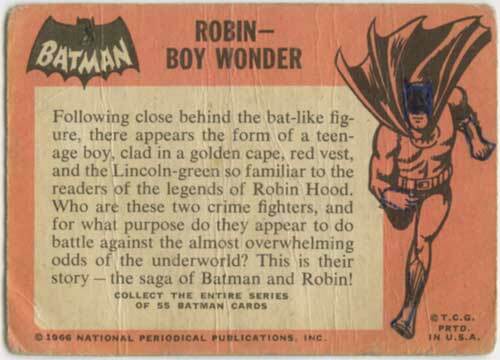 The Batman card pictured above is naturally card #1 in the set, but what would he be without the Boy Wonder? 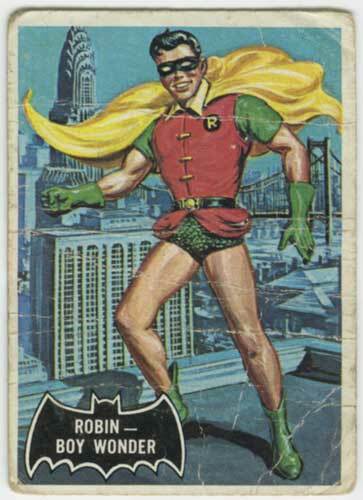 As cool as the Batman card is, I really love the Gotham City background on Robin’s card. Here’s the back. It’s a little hard to tell, thanks to someone’s unsolicited edits to the artwork on the back, but Robin comprises card #2 in the set. Two down, 55 to go. 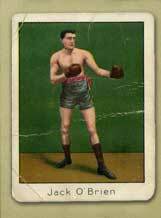 I scored the lot of 13 cards for $6.57 with free shipping. As you can tell by these 2, the condition of the cards might leave something to be desired, if you care for that kind of thing. But for just over 50¢ a pop, I’ll take it. 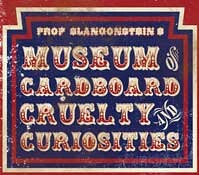 I’ll be posting the remainder of the cards in drips and drabs along with some other nuggets of information about the set in the coming days (Or maybe weeks. Who knows?). 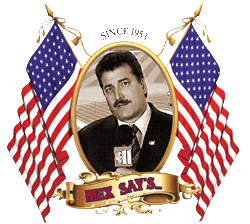 By the way, it’s really killing me not to include some form of “Stay tuned. Same Bat Time. Same Bat Channel”. in this wrap up.